Sometimes, you actually have to do things to know what doesn’t work for you. To confirm it’s not just a thing people say, but a thing people say for a reason. For me as a runner, this means knowing what works (and what doesn’t) the afternoon after a marathon training long run. I do more of these things than I should admit. Consider this post a case of do as I say, not as I do. It will be tempting to do nothing after a long run. After all, you’ll be tired and you’ve earned some rest, right? If you sit on the couch and don’t move, your muscles will tighten up. You will really regret it when you have to move again. Stretch and cool down properly. Keep moving through the day so your muscles stay loose. Foam roll or use The Stick a bit later in the afternoon. Take a walk around the neighborhood or an easy bike ride the afternoon after a long run. Nothing too strenuous, but keep your body and your muscles moving, at least a little. I’m often not very hungry when I finish a long run. By the time I finish stretching and cooling-down, I’ll often forget to eat. After a long run, your body will be depleted. Even if you’ve fueled well on the run, your body’s stores of carbs, glycogen, protein, and water will all be running low. In order to rebuild the muscles that you’ve broken down on your run, refuel. Eat something with a carb to protein ratio of 3:1 (think peanut butter toast) within 20 minutes of finishing. Eat a full meal within 3-4 hours. My apologies for TMI, but I am a super sweaty runner. I could run 100 yards in near freezing temps and I’d likely break a sweat. Can you imagine what I look like after a long run? I’m often far from home for my long runs, or running with a group where we may socialize or brunch after a long run. All that to say, I often find myself staying in my running clothes way longer than I should after a long run. It can be very bad to stay in sweating running clothes when you are done running. It creates all kinds of bacteria and fungus issues. Staying in damp clothes can also make body temperature issues worse. After a long run, how can I be freezing and roasting at the same time? I have no idea, but staying in damp running clothes doesn’t help. If you are at home, get out of running clothes and shower ASAP. 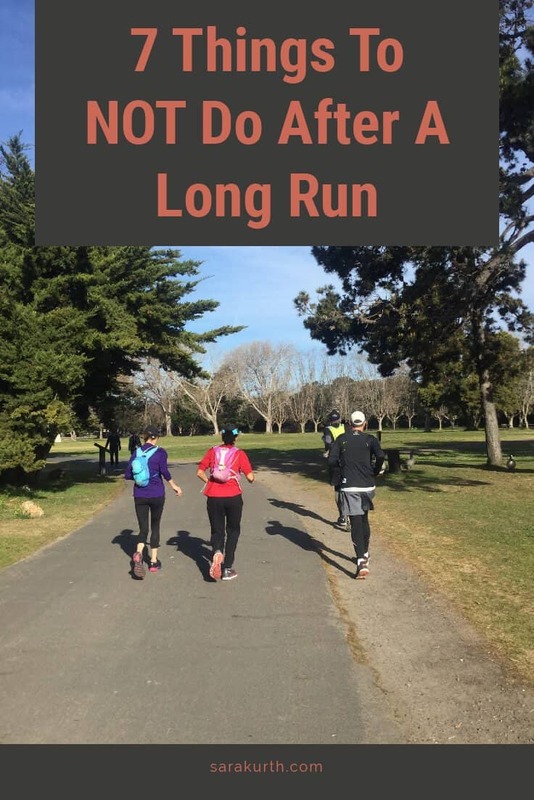 This one has never been a problem for me personally, but I know some people struggle with it: after a long run, you need to let your body recover. The day after a long run should be a rest day or an easy run/active recovery day. Don’t do an intense or difficult workout the afternoon of or the day after a long run. Leave the track work and speed work for a few days after a long run. OK, not those things exactly, but anything requiring brain power. Runner’s Brain is a very real thing. The glycogen that fuels your body also fuels your brain. As you run (and your glycogen is depleted) your brain may get a little fuzzy. I can usually feel myself starting to get stupider around mile 14. Don’t make any important decision, or anything requiring major brainpower, the afternoon after a long run. Be easy on yourself and arrange your day (and your to-do list) accordingly. Related to not doing brain surgery, don’t do anything that requires (or potentially requires) emotional control or restraint. Again, you’ll be emotionally and physically exhausted. When that happens, it can be hard to control your emotions. Make sure family/loved ones know what to expect. Try to notice if/when you are losing your patience or temper. This is good advice for always, but especially on long run days, when you’ll have a (much?) shorter trigger. You’ll have worked out hard, so you may be more inclined to treat yourself. There is even a name for this: hedonic compensation. Rewarding yourself for doing something virtuous. I can’t in good conscience advise to not treat yourself. I know the ‘right’ fitness advice is to not use food as a reward for fitness accomplishments, but I know, after years of trial and error, it is one of the few rewards that consistently works for me, so I do it. Rare is my long run that isn’t rewarded by pizza, a can of coke, and/or a cupcake. That’s right, I said ‘and.’ I’m not ashamed. Don’t use food as a reward for fitness accomplishments (sorry, I still had to include it. It’s good advice, even if I don’t follow it myself). If you are going to reward yourself with food, plan it out in advance. Don’t buy a dozen cupcakes and tell yourself you’ll only have one after the run. One will lead to two, which will lead to three (not that I know that from first-hand experience or anything). What about you? Is there anything you know you shouldn’t do after a long run? I was reading an article yesterday on why people often put on weight when marathon training and many reasons link in with the things here, like staying on the couch the rest of the day, reward eating etc. I didn’t know that re runner’s brain. Good to know (and warn others about!). Katie recently posted…65 ways to say I love you this Valentine’s Day.